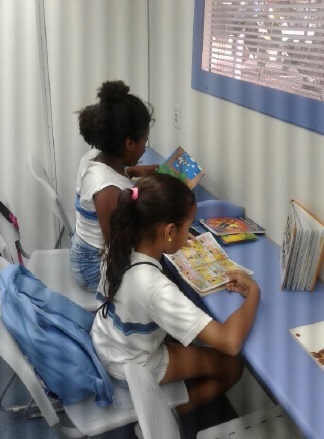 The project consists of a bus adapted to be a traveling library, with a collection of around 2,000 books, to be loaned out for free to members of ten needy communities in Rio de Janeiro that don’t have libraries of their own. The bus also functions as a reading space in the community, offering book loans (upon registration made onsite) and promotional activities to encourage reading, along with parallel cultural activities such as dramatic reading literary theater, and storytelling. With the aim of serving the greatest number of people possible and to encourage reading in the communities, the project visits schools, daycares, NGOs, and community associations to invite people to participate in the project’s activities.